Joe Farnsworth is undoubtedly one of the best drummers today in the more traditional, straight-ahead school of jazz. He has appeared on numerous times on Venus Records CDs led by Eric Alexander, but this time he took the lead and made a fabulous album in tribute to his heroes, legendary jazz drummers. Farnsworth dedicates one tune for each drummer, either his own composition or a song associated with the drummer in question. They are, in the order of the tunes, Max Roach, Art Blakey, Billy Higgins, Art Taylor, Alan Dawson, Buddy Rich, Philly Joe Jones, Elvin Jones, Baby Dodds and Roy Haynes. As expectd, his bandmates and long-time collaborators (Eric Alexander, Harld Mabern and Nat Reeves) do a fantastic job, but the focus of this album is clearly on Farnsworth and his fantastic drumming. Highly recommended to fans of hard bop and of jazz drumming! Recorded at Studio Sound Valley in Tokyo on April 19, 2014. Joe Farnsworth has been a major drummer for the past 20 years. Along the way he has worked with many of the top jazz musicians in New York including Jon Hendricks, Diana Krall, Wynton Marsalis, Cedar Walton, Benny Golson, Benny Green and, perhaps most notably, tenor-saxophonist Eric Alexander. Farnsworth has been part of Alexander's quartet since the late 1990s. 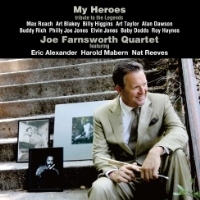 For this tribute to ten classic drummers, Farnsworth leads the Eric Alexander Quartet which also includes pianist Harold Mabern and bassist Nat Reeves. Farnsworth plays a selection apiece dedicated to Max Roach, Art Blakey, Billy Higgins, Art Taylor, Alan Dawson, Buddy Rich, Philly Joe Jones, Elvin Jones, Baby Dodds and Roy Haynes including three originals. While occasionally hinting at his heroes, Farnsworth primarily plays in his own modern jazz style, swinging the ensembles and taking occasional solos. "George's Dilemma," which was in the repertoire of the Clifford Brown-Max Roach Quintet, sets the stage for the rest of the CD. Alexander's playing is quite passionate throughout this project, there is a piano solo in the hard bop tradition by Mabern, and Farnsworth takes a chorus. On "Moanin'," Mabern and Alexander are both quite creative in their solos. "No Fills" is one of several pieces in which the group sounds a bit like the John Coltrane Quartet. Dedicated to Billy Higgins, the uptempo modal piece is a bit reminiscent of "Impressions" and has a particularly heated tenor-drums tradeoff. The mood continues on "Syeeda's Song Flute" (for Art Taylor) and later on during an intense "Greensleeves" (for Elvin Jones). Farnsworth is in the spotlight for a pair of unaccompanied solos: a brief one for Alan Dawson ("Here We Go, Here We Go") and a slightly longer feature ("Musashi") for Baby Dodds. Also on this set are "Cute," an explosive version of "Two Bass Hit" and a trio feature on Ray Bryant's "Reflection." Joe Farnsworth spends most of this program accompanying and driving the other musicians with his solos being concise and meaningful. The result is a satisfying set of modern jazz.